A recent Google search on a completely unrelated topic, lead me to a hospice website. 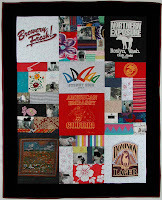 I found some photos there of a Memorial Quilt that they had made. As an amateur seamstress myself from a family of professional seamstresses, this peaked my interest. After additional searches, I came upon the AIDS Memorial Quilt. I remember hearing about this years ago. I even saw a few pictures. But I don't remember really looking at it and trying to see what each block was saying about the person it memorialized. The AIDS Memorial Quilt was first established in 1987 to not only remember those who had died but to build awareness for HIV/AIDS. It was meant to give names to the numbers. It is the largest community art piece in the world, containing approximately 48,000 panels that would cover 185 basketball courts (2007 statistics). The panels have now been photographed and archived on the group's website and can be viewed there. Some of the 3X6 foot panels are very simple, with just a plain background and a name. They are very profound in their simplicity. Others are more ornate with pictures of the deceased or religious or other symbols. I think the Olympic flame on this block is not only representing an Olympic athlete. Like the flames seen in memorial monuments and grave stones, it is an eternal flame. There is actually a lot of similarity in the symbolism of the Olympic torch (that burns continuously through the Olympic games) and the eternal flame. The ship, also found in this block, is sailing off into the sunset. On it's sail are symbols that represent the deceased. 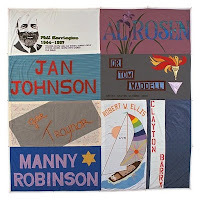 While the AIDS Memorial Quilt may have slowed down in the past few years, as less people are dying from AIDS, more blocks are still being added and parts of the Quilt are on display around the country. More recently, memorial quilts have been made in honor of those who died in the 9/11 attacks. There really aren't any fixed rules when making a memorial quilt. You can find memorial quilts made from t-shirts and other fabric belonging to someone who has died. Photos and even documents such as letters can be printed on to fabric to be added to quilts. This quilt has printed pictures (intentionally blurred), parts of t-shirts, and fabric from the deceased clothes. 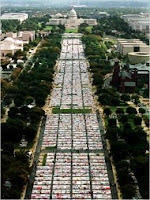 Like the AIDS Quilt, they are often mixed media, with paint, needle work, and pretty much anything that can be sewn on. I found this quote talking about the AIDS Memorial Quilt, but I think it's a great description of all such works of art. "The Quilt has redefined the tradition of quilt-making in response to contemporary circumstances. A memorial, a tool for education and a work of art, the Quilt is a unique creation, an uncommon and uplifting response to the tragic loss of human life."